P22 Blog: P22 and the Hamilton Wood Type Museum Proudly Announce HWT Slab- lost twins of bold, rugged wood type. P22 and the Hamilton Wood Type Museum Proudly Announce HWT Slab- lost twins of bold, rugged wood type. HWT Slab features two styles-Antique and Columbian. These two extra bold fonts are classic slab serif wood type styles with one detail of difference. Columbian is an extra bold Clarendon wood type that was manufactured by many of the wood type manufacturers in the late 19th century. "Clarendons" feature bracketed or rounded serif joins whereas "Antique" was a class of typefaces that features squared off slab serifs. Some type designs have only minor differences from others. The Columbian design is essentially identical to Wm. Page & Co.'s "Antique no. 4", with the difference being the bracketed serifs. In researching material for the digitization of Columbian, we started with a 15 line font identified as "Columbian" shown in the Angelica Press wood type portfolio (printed in 1976). This font is in fact "Page Antique no. 4". Comparing Antique #4 to Columbian specimens from Hamilton and other manufacturers confirms the only real difference is the serif treatments. Therefore, both fonts are presented as a pair. Each font features a full Western & Central European character set. HWT Slab digitized by Tim Martin. For more information and to purchase HWT Slab, click here. Special Introductory Pricing. 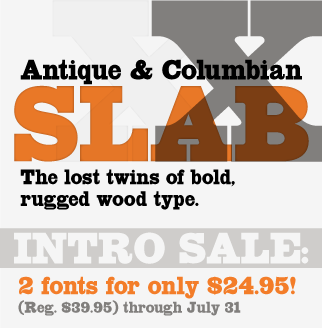 Purchase the Slab Set of two fonts for a special intro price of only $24.95 (reg. $39.95)- 2 fonts for the price of one! This offer is good through July 31, 2013.